For other uses, see Conversion of Paul the Apostle (disambiguation). Paul's conversion experience is discussed in both the Pauline epistles and in the Acts of the Apostles. According to both sources, Paul was not a follower of Jesus and did not know him before his crucifixion. Paul's conversion occurred after Jesus' crucifixion. The accounts of Paul's conversion experience describe it as miraculous, supernatural, or otherwise revelatory in nature. Paul also discusses his pre-conversion life in his Epistle to the Philippians,[3:4-6] and his participation in the stoning of Stephen is described in Acts 7:57-8:3. The Epistle to the Galatians also describes his conversion as a divine revelation, with Jesus appearing to Paul. For you have heard of my previous way of life in Judaism, how intensely I persecuted the church of God and tried to destroy it. I was advancing in Judaism beyond many of my own age among my people and was extremely zealous for the traditions of my fathers. But when God, who set me apart from my mother’s womb and called me by his grace, was pleased to reveal his Son in me so that I might preach him among the Gentiles, my immediate response was not to consult any human being. Acts of the Apostles discusses Paul's conversion experience at three different points in the text, in far more detail than in the accounts in Paul's letters. The Book of Acts says that Paul was on his way from Jerusalem to Syrian Damascus with a mandate issued by the High Priest to seek out and arrest followers of Jesus, with the intention of returning them to Jerusalem as prisoners for questioning and possible execution. The journey is interrupted when Paul sees a blinding light, and communicates directly with a divine voice. As he neared Damascus on his journey, suddenly a light from heaven flashed around him. He fell to the ground and heard a voice say to him, "Saul, Saul, why do you persecute me?" 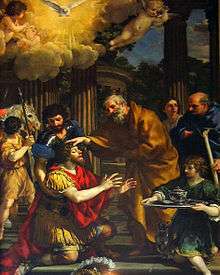 Ananias Restoring the Sight of St. Paul (c.1631) by Pietro da Cortona. "Lord," Ananias answered, "I have heard many reports about this man and all the harm he has done to your holy people in Jerusalem. And he has come here with authority from the chief priests to arrest all who call on your name." Then Ananias went to the house and entered it. Placing his hands on Saul, he said, "Brother Saul, the Lord—Jesus, who appeared to you on the road as you were coming here—has sent me so that you may see again and be filled with the Holy Spirit." Immediately, something like scales fell from Saul’s eyes, and he could see again. He got up and was baptized, and after taking some food, he regained his strength. Acts' second telling of Paul's conversion occurs in a speech Paul gives when he is arrested in Jerusalem. [Acts 22:6-21] Paul addresses the crowd and tells them of his conversion, with a description essentially the same as that in Acts 9, but with slight differences. For example, Acts 9:7 notes that Paul's companions did not see who he was speaking to, while Acts 22:9 indicates that they did share in seeing the light (see also Differences between the accounts, below). This speech was most likely originally in Aramaic (see also Aramaic of Jesus), with the passage here being a Greek translation and summary. The speech is clearly tailored for its Jewish audience, with stress being placed in Acts 22:12 on Ananias' good reputation among Jews in Damascus, rather than on his Christianity. Critics of the NIV, New Living Translation, and similar versions contend that the translation used for Acts 22:9 is inaccurate. The verb used here — akouō (ἀκούω) — can be translated both "hear" and "understand" (both the KJV and NIV translate akouō as "understand" in 1 Cor. 14:2, for example). It often takes a noun in the genitive case for a person is being heard, with a noun in the accusative for the thing being heard. More classically, the use of the accusative indicates hearing with understanding. There is indeed a case difference here, with Acts 9:7 using the genitive tēs phōnēs (τῆς φωνῆς), and Acts 22:9 using the accusative tēn phōnēn (τὴν φωνὴν). However, there has been debate about which rule Luke was following here. On the second interpretation, Paul's companions may indeed have heard the voice (as is unambiguously stated in Acts 9:7), yet not understood it, although New Testament scholar Daniel B. Wallace finds this argument based on case inconclusive. A similar debate arises with the NIV's use of the word "sound" instead of "voice" in Acts 9:7. The noun used here — phōnē (φωνῆ) — can mean either. By translating 9:7 as "they heard the sound" instead of "they heard the voice," the NIV allows for Paul's companions to have heard an audible sound in Acts 9:7 without contradicting the statement in Acts 22:9 that they did not hear a comprehensible voice. 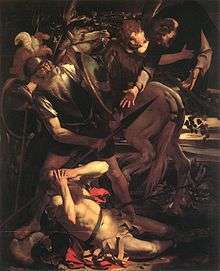 The Conversion of Saint Paul, a 1600 painting by the Italian artist Caravaggio. The conversion of Paul, in spite of his attempts to completely eradicate Christianity, is seen as evidence of the power of Divine Grace, with "no fall so deep that grace cannot descend to it" and "no height so lofty that grace cannot lift the sinner to it." It also demonstrates "God's power to use everything, even the hostile persecutor, to achieve the divine purpose." The transforming effect of Paul's conversion influenced the clear antithesis he saw "between righteousness based on the law," which he had sought in his former life; and "righteousness based on the death of Christ," which he describes, for example, in the Epistle to the Galatians. The Bible says that Paul's conversion experience was an encounter with the resurrected Christ. Alternative explanations have been proposed, including sun stroke and seizure. In 1987, D. Landsborough published an article in the Journal of Neurology, Neurosurgery, and Psychiatry, in which he stated that Paul's conversion experience, with the bright light, loss of normal bodily posture, a message of strong religious content, and his subsequent blindness, suggested "an attack of [temporal lobe epilepsy], perhaps ending in a convulsion ... The blindness which followed may have been post-ictal." This conclusion was challenged in the same journal by James R. Brorson and Kathleen Brewer, who stated that this hypothesis failed to explain why Paul's companions heard a voice (Acts 9:7), saw a light,[Acts 22:9] or fell to the ground. [Acts 26:14] Furthermore, no lack of awareness of blindness (a characteristic of cortical blindness) was reported in Acts, nor is there any indication of memory loss. Additionally, Paul's blindness remitted in sudden fashion, rather than the gradual resolution typical of post-ictal states, and no mention is made of epileptic convulsions; indeed such convulsions may, in Paul's time, have been interpreted as a sign of demonic influence, unlikely in someone accepted as a religious leader. A 2012 paper in the Journal of Neuropsychiatry and Clinical Neurosciences suggested that Paul’s conversion experience might be understood as involving psychogenic events. This occurring in the overall context of Paul’s other auditory and visual experiences that the authors propose may have been caused by mood disorder associated psychotic spectrum symptoms. A completely different theory has been put forward in 2015 by astronomer W. K. Hartmann who argues that the three accounts in the book of Acts describe exactly the sequence of events that occur when a fireball, like the Chelyabinsk meteor of 2013, passes through the sky. This includes people being knocked off their feet, the physical effects on Saul's eyesight, etc. La conversion de Saint Paul by Luca Giordano (1690), Museum of Fine Arts of Nancy. The conversion of Paul has been depicted by many artists, including Albrecht Dürer, Francisco Camilo, Giovanni Bellini, Fra Angelico, Fra Bartolomeo, Pieter Bruegel the Elder, William Blake, Luca Giordano, and Juan Antonio de Frías y Escalante. The Renaissance Italian master Caravaggio painted two works depicting the event: The Conversion of Saint Paul and Conversion on the Way to Damascus. Peter Paul Rubens also produced several works on the theme. Michelangelo's The Conversion of Saul is housed in the Cappella Paolina of the Vatican Palace. The conversion of Paul is the main term of argument of Felix Mendelssohn Bartholdy's oratorio Paulus (St. Paul), MWV A 14 / Op. 36] (1833–36). It is also the subject of the medieval play The Digby Conversion of Saint Paul and the choral motet Saule, Saule, quid me persequeris by Giaches de Wert (1535–1596). It is also the focus of an eight part mixed choir a cappella piece (The Conversion of Saul) composed by Z. Randall Stroope. In chapter seventeen of Ralph Ellison's Invisible Man, there is a literary device to the Saul to Paul conversion: "'You start Saul, and end up Paul,' my grandfather had often said. 'When you're a youngun, you Saul, but let life whup your head a bit and you starts to trying to be Paul – though you still Sauls around on the side.'" From the conversion of Paul, we get the metaphorical reference to the "Road to Damascus" that has come to refer to a sudden and/or radical conversion of thought or a change of heart or mind, even in matters outside of a Christian context. For example, Australian politician Tony Abbott was described as having been "on his own road to Damascus" after pledging increased mental health funding, and a New Zealand drug dealer turned police officer was likewise described as taking "the first step on the road to Damascus." The Feast of the Conversion of Saint Paul the Apostle is a feast celebrated during the liturgical year on January 25, recounting the conversion. This feast is celebrated in the Roman Catholic, Anglican and Lutheran churches. This feast is at the conclusion of the Week of Prayer for Christian Unity, an international Christian ecumenical observance that began in 1908, which is an octave (an eight-day observance) spanning from January 18 (observed in Anglican and Lutheran tradition as the Confession of Peter, and in the pre-1961 Roman Catholic Church as the feast of the Chair of Saint Peter at Rome) to January 25. In rural England, the day functioned much like groundhog day does in the modern-day United States. Supposed prophecies ranged from fine days predicting good harvests, to clouds and mists signifying pestilence and war in the coming months. ↑ Bromiley, Geoffrey William (1979). International Standard Bible Encyclopedia: A-D (International Standard Bible Encyclopedia (W.B.Eerdmans)). Wm. B. Eerdmans Publishing Company. p. 689. ISBN 0-8028-3781-6. ↑ John Phillips, Exploring Acts: An expository commentary, Kregel Academic, 2001, ISBN 0-8254-3490-4, p. 179. 1 2 C. K. Barrett, A Critical and Exegetical Commentary on the Acts of the Apostles: Introduction and commentary on Acts XV-XXVIII, Continuum, 2004, ISBN 0-567-08395-0, pp. 1029-1031. ↑ Charles H. Talbert, Reading Acts: A Literary and Theological Commentary on the Acts of the Apostles, Smyth & Helwys, 2005, ISBN 1-57312-277-7, pp 208-209. 1 2 Ben Witherington, The Acts of the Apostles: A socio-rhetorical commentary, Eerdmans, 1998, ISBN 0-8028-4501-0, pp. 312–13. ↑ Mike Davis, The Atheist's Bible Companion to the New Testament: A Comprehensive Guide to Christian Bible Contradictions. Denver: Outskirts Press, Inc., 2009, pp 169–70. ↑ J. W. Wenham, The Elements of New Testament Greek, Cambridge, 1991, p. 203. ↑ Herbert Weir Smyth and Gordon M. Messing, Greek Grammar, 2nd ed., Harvard University Press, 1956, ISBN 0-674-36250-0, p. 323. 1 2 3 Nigel Turner, Grammatical Insights Into the New Testament, Continuum, 2004, ISBN 0-567-08198-2, pp. 87–90. ↑ Frederick Fyvie Bruce, The Acts of the Apostles: The Greek Text with Introduction and Commentary, 2nd ed, Eerdmans, 1990, ISBN 0-8028-0966-9, p. 236. ↑ Daniel B. Wallace, Greek Grammar Beyond the Basics: An Exegetical Syntax of the New Testament, Zondervan, 1997, ISBN 0-310-21895-0, p. 313. ↑ NASB: Acts 9:7 and 22:9. ↑ NCV: Acts 9:7 and 22:9. ↑ ESV: Acts 9:7 and 22:9. ↑ HCSB: Acts 9:7 and 22:9. ↑ The Message: Acts 9:7 and 22:9. ↑ La Bible du Semeur: Acts 9:7 and 22:9. ↑ Richard N. Longenecker, The Ministry and Message of Paul, Zondervan, 1971, ISBN 0-310-28341-8, p. 32. ↑ For example, R. C. H. Lenski, Interpretation of the Acts of the Apostles 1–14, Volume 1, 1944 (reprinted 2008 by Augsburg Fortress, ISBN 0-8066-8075-X), p. 356; or the Ignatius Catholic study Bible on Acts 9:7. 1 2 Johann Peter Lange (ed. ), A commentary on the Holy Scriptures: critical, doctrinal, and homiletical, Volume 8, Scribner, 1868, p. 24. ↑ Jean Marie Hiesberger, The Catholic Bible, Personal Study Edition: New American Bible, Oxford University Press US, 2007, ISBN 0-19-528926-9, p. 341. 1 2 3 G. Walter Hansen, "Paul's Conversion and His Ethic of Freedom in Galatians," in The Road from Damascus: The impact of Paul's conversion on his life, thought, and ministry, Richard N. Longenecker (ed. ), Eerdmans, 1997, ISBN 0-8028-4191-0, pp. 213–37 (quotes on p. 214). ↑ Hartmann, William K. (2015). "Chelyabinsk, Zond IV, and a possible first-century fireball of historical importance". Meteoritics & Planetary Science. 50 (3): 368. Bibcode:2015M&PS...50..368H. doi:10.1111/maps.12428. ↑ "Falling meteor may have changed the course of Christianity - space - 22 April 2015 - New Scientist". Retrieved 2015-04-24. ↑ Gosudarstvennyĭ Ėrmitazh, Peter Paul Rubens, a touch of brilliance: oil sketches and related works from the State Hermitage Museum and the Courtauld Institute Gallery, Prestel, 2003. ↑ Mental health experts praise Abbott's spending pledge, ABC News, Thu Jul 1, 2010 12:04am AEST, accessed 3 July 2010. ↑ Savage, Jared (3 July 2010). "Drug dealer hired as police officer". The New Zealand Herald. Retrieved 26 September 2011. ↑ Folklore Myths and Legends of Britain (2 ed.). Great Britain: Reader's Digest Association Ltd. 1977. p. 23. ISBN 9780276000393. Richard N. Longenecker (ed. ), The Road from Damascus: The impact of Paul's conversion on his life, thought, and ministry, Eerdmans, 1997, ISBN 0-8028-4191-0, 253 pages. Thomas Martone, The theme of the conversion of Paul in Italian paintings from the early Christian period to the high Renaissance, Garland Pub., 1985, ISBN 0-8240-6882-3, 254 pages. 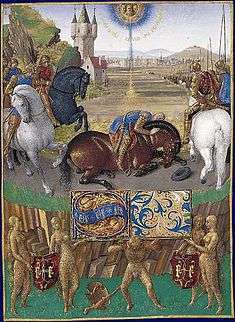 Wikimedia Commons has media related to Conversion of Saint Paul.